The principal aim of the project “Combining and improving online bird portals data to display near-real-time spatiotemporal patterns of bird distribution across Europe", known by the acronym LIFE Euro Bird Portal (LIFE15 PRE/ES/000002), is to develop the EuroBirdPortal (EBP) demo viewer into a full-fledged web portal displaying detailed and up-to-date European-wide spatiotemporal patterns of bird distribution in near-real-time and in a reliable manner. The project has a duration of three years (January 2016 to December 2018) and an overall cost of 510.557 €, of which 60% (306.334 €) are financed by the European Union. 1To create a new EBP data sharing standard, database repository and data-flow system capable of managing automatically and in near-real-time all data interchange processes between the local online portals and the central databank. 2Adapt and improve the current EBP demo viewer and the spatial bird distribution models in order to reliably display detailed and up-to-date European-wide spatiotemporal patterns of bird distribution in near-real-time. 3Increase the geographical coverage of the EBP project to include most of the European Union (>90% of its territory). 4Improve the quality and relevance of the data collected. 1The data flow of 12 online systems or, at least, the equivalent to more than 80% of all data collected by EBP partners are automatically connected to the new database repository using the new data sharing standard. 2The EBP viewer depicts the whole geographic area covered by the project, and includes 100 bird species and “average” maps. 3The EBP viewer content is updated at weekly intervals with data up-to-dated to the previous week and incorporates the new spatiotemporal models of bird distribution. 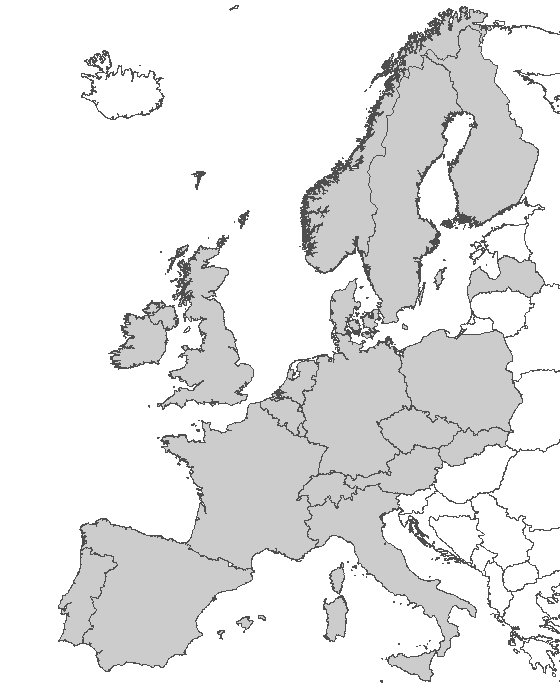 4The area covered by the EBP project includes at least 90% of the EU territory. 5Two reference documents, one on best practices and another on portals quality indicators and benchmarks are produced. 6Overall, the actions directed to improve data quality and relevance produce a significant increase in the percentage of observations submitted to the central database included in complete lists (>10%) and a reduction of 20% of the areas identified as "poorly surveyed". 7At least two trials combining EBP data with other sources of bird movement and connectivity information are conducted. During the last ten years, the number and diversity of web portals dedicated to the collection of bird observations has increased rapidly and most of Europe is now covered by at least one of them. Some portals are based on very specific systems and cover a limited geographical area (e.g. a region or country) while others function across several countries using the same basic package. While there is substantial variation in the scope and volumes of data gathered by different portals, the advent of online data collection has produced a vast amount of data that would previously have been impossible to amass. Online bird portals aim mainly to obtain year-round data from the relatively unstructured but intensive and widespread activities of birdwatchers. Thus, complementing well-structured monitoring programmes and atlases in periods of the year and situations where these invaluable surveys are not available or feasible. In fact, despite data gathered by online portals follow simple standardised protocols (e.g. complete lists), or in some cases even no protocol at all (casual observations), the vast amount of data contained in these portals and the sheer amplitude of their combined geographical and taxonomic coverage offer great potential for research on the temporal and spatial distribution of birds across large geographical areas. Such knowledge is urgently needed in order to increase understanding of bird distributions and movements and to address EU policy needs under the EU Birds Directive (e.g. providing early-warning systems, predicting wildfowl movements due to cold spells, improving the delimitation of species-specific hunting seasons, monitoring range changes for pests and invasive species, monitoring avian-borne diseases, etc.). In order to make best use of the data gathered by online portals across Europe, however, a common database needed to be developed. Data sources were very scattered, and several portals provided limited access to raw data or were available only in the native languages of their host countries. Moreover, given the diversity of initiatives and the well established nature of some of them, any attempt to favour only one of the systems or to create a new common one would have been both undesirable and impractical. 1 To describe large scale spatiotemporal patterns of bird distributions (seasonal distributional changes, migratory patterns, phenology) and their changes over time. 2 To improve the value of online data gathering portals. The EBP project was formally established in March 2015. 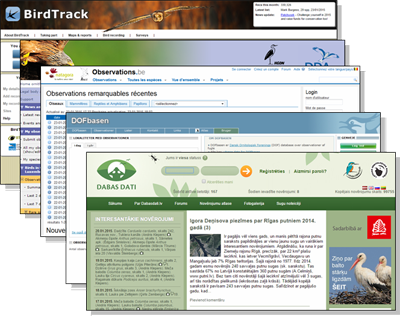 However, it is the result of an intensive initiative started in September 2012 with the creation of a working group devoted to explore the possibilities of integrating and analysing data from a number of European on-line bird portals, following up with the organization of the first EBP meeting in Switzerland in June 2013 for this purpose. The partnership is formally based in two key agreements: the Collaborative agreement between on-line bird recording schemes operating in Europe and the Collaborative agreement between on-line bird recording schemes participating in the EuroBirdPortal (EBP) project. The first is a generic agreement promoted by the EBCC since 2013 to encourage data sharing and research at the European scale and to support the development of future European Breeding Bird Atlases. The second and more recent agreement is made within the framework of the more generic one, and sets out the specific terms and conditions of the EBP initiative and names the EBCC as the organization formally responsible of the project and owner of its intellectual property. Currently, the EBP project is developed through a partnership that involves 69 institutions of 21 European countries (18 of them EU state members). These institutions mostly comprise biodiversity data centres and reference ornithological institutions in their respective countries, accumulating a long-time experience collecting high quality monitoring data from thousands of volunteer birdwatchers and turning this information into sound results. Overall, the online data gathering portals run by the EBP partners collect c. 30 million bird records every year thanks to the collaboration of more than 100,000 volunteer observers. This is the largest and most dynamic citizen science biodiversity data flow currently existing in Europe which, during the last years, has been increasing at an annual rhythm of c.20% both in terms of participation and number of observations submitted. The project currently manages a dataset of aggregated data by week and 10x10 km square (European Environment Agency reference grid ETRS89-LAEA) based on the 110 million raw bird records collected between 2010 and 2014 by the partner’s portals. This dataset includes species-specific information but also some data about observer effort; however, since a significant portion of the original data is still largely gathered as casual records (i.e. not including recording effort or information on the species not detected) observational effort cannot be estimated as efficiently as would be desired. In fact, some online portals still do not allow the submission of complete lists and in some countries the use of more structured protocols are not sufficiently promoted among birdwatchers. Moreover, though the local portals collect data of nearly all bird species present in Europe, the EBP dataset currently only contains species-specific information for a set of 55 species. Each partner submits its data to the EBP project using a quite simple standard data format. And each partner has its own check protocols to deal with potentially erroneous observations, though additional data quality checks are conducted at the EBP level. Currently, the whole data flow is managed on a manual or semiautomatic basis and the partner’s datasets are not directly connected with the central EBP data repository. These technical limitations prevent a real-time or nearly real-time approach to data analysis and visualization. On the other hand, taking into account the large, continental, scale of the initiative, the level of data aggregation (by week and 10x10 km square) gives a relatively high resolution in time and space. However, this level of aggregation is too coarse to produce sound models of spatiotemporal patterns of bird distribution. To further advance towards a more disaggregated data standard, however, it is important to move step by step and building up the required confidence among the partners (who only very recently have started to share data and work co-jointly). In terms of geographical coverage, currently the portals involved in the EBP project already collect bird observations from an area that represents 34% of Europe and 78% of the EU. However, many countries, particularly in E and SE Europe, are still not taking part in the project either because they do not have online bird portals in place, due to limited working or technological capacities, or just because they collect very few data. On the other hand, in the area already covered by the EBP project bird records are overall extremely high in number; however, there are still large geographical and temporal differences. Some countries or entire big regions are still poorly surveyed or have very few observers (e.g. large parts of the Iberian Peninsula, Poland and northern Scandinavia), while others received little attention for large periods of the year. To show the scope and potential of the EBP project and its future developments, the project launched its demo viewer in June 2015 in the framework of the Green Week. The EBP demo viewer shows animated maps depicting the week by week distributional patterns of a selected group of species in four years (2010-2013) at a resolution of 30x30 km. Four species maps (occurrence, traces, counts and phenology) reflect, in different ways, the raw information contained in the aggregated data, while a fifth one uses various analytical procedures to account for differences in observational effort and species reporting rates. Temperature and precipitation maps (E-OBS v.10.0) are also shown for comparative purposes (only in the map to the right). Two animated maps of any species or climatic variable, year and type can be selected to be shown simultaneously for direct comparison. Currently, the viewer depicts information for 40 of the 55 target species, but a new species will be added every week until the end of 2015 and the whole maps will be updated with 2014 data in the next few months.